You may have noticed that your favorite restaurant offers toothpicks at the end of your meal to remove food debris from your teeth. While this is a nice gesture, it’s not a good way to remove food debris in the first place. What they should be offering is a box of floss or a floss pick, but that’s another story. According to your dentist, flossing isn’t just for removing food particles from you mouth. It’s also about removing excess plaque and preventing tartar that builds up over time. To do this, you’ll need to incorporate flossing into your at-home oral care routine. Plaque is a sticky substance that builds up all around your teeth throughout the day as you eat and drink. If you run your finger against your teeth, it won’t be as smooth as you expect it to be. That’s because millions of bacteria are stuck to your teeth, producing acid from the sugars you eat and wearing down your enamel. Tartar is a hardened form of plaque that can severely damage your gumline if not removed. However, this form of plaque can only be removed by your dentist. When you brush, you remove about 60 percent of plaque that builds up daily on the surface and sides of your teeth. However, the bristles can only go so far, even if you use an electronic toothbrush. 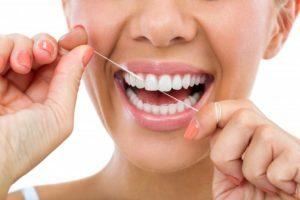 When you floss, you’re able to remove the remaining 40 percent that lives in the deep nooks and crannies of your mouth. Technically, each of your teeth have five surfaces: the front, back, the two sides, and the chewing surfaces. Plaque easily collects on all of these areas, meaning you’ll need to use the right tools in order to remove all of it. It’s worth flossing to remove this plaque, especially if you care about retaining a whiter smile. Collected plaque contributes highly to the color of your smile. Pull out at least 18 inches of floss so you have enough to wrap around your fingers. Count the spaces as you thread in between each tooth. Make sure your floss is thin enough to slide easily in between your teeth, but thick enough to contact both sides of each tooth. If this is too difficult, purchase a handheld floss holder and use it after brushing. To remove more food debris, use a mouthwash in between brushing and flossing to remove additional food debris. Flossing doesn’t have to be a difficult endeavor. It’s worth it to prevent tooth decay and gum disease from appearing. Schedule an appointment with your dentist today to see how your effective your oral care has been! After earning his DDS from the University of Health Science Center at San Antonio, Dr. Robert Long became a member of many notable dental organizations. They include the ADA, the Texas Dental Association, the Academy of General Dentistry, and the Fort Worth District Dental Society. To learn more about flossing techniques and his practice, contact him at either one of his dental practices through his website.